I made this for Thanksgiving and it was wonderful. My husband keeps asking when I’ll make it again. (I’m waiting for the holidays). 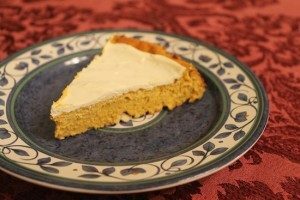 It seemed a little complicated, as they’re three steps but the crust and topping are really easy to make – as is the filling. Make it the day ahead if you can and enjoy! It’s Gluten free and sugar free as well, but you could substitute Rapadura for the Stevia if you’d like. It was even prettier before we cut it. Great for a special dinner. Coat a 9” springform pam with the softened butter. Pour the ground almonds into the pan and shake it to distribute the crumbs over the sides and bottom. This is the ‘crust’. In a mixer, with the paddle attachment, mix together the cream cheese and stevia. Add in the pumpkin and spices, then add the vanilla and orange zest. Add in the eggs, one at a time, mixing only enough to incorporate. Pour into the springform pan and bake for 55 minutes. Once it’s out of the oven, top immediately with the sour cream mixture. Let cool and refrigerate for a least 4 hours – it’s better if you can make it the day before you serve it and refrigerate overnight. Enjoy!